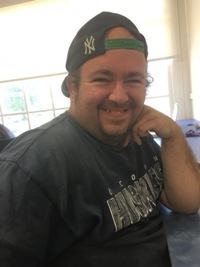 Obituary for Nathaniel Nelson Hartley | Doolittle Funeral Service, Inc.
Nathaniel Nelson Hartley, 34, of East Hartford, died suddenly on August 31, 2018 at Hartford Hospital. Born in Hartford, he was the son of John N. Hartley of East Hartford and the late Joan A. (Stevens) Hartley. Nathaniel loved golfing, online gaming, and throwing a frisbee at the beach every chance he got. Nathaniel was a huge New York Yankees fan. Funeral services and burial will be private and at the convenience of the family. Family and friends may call on Thursday evening from 5:00 to 7:00 pm at the Cromwell Funeral Home, 506 Main Street, Cromwell. In lieu of flowers, donations in Nathaniel’s memory may be made to the charity of the donor’s choice. To share memories or send condolences to the family, please visit www.doolittlefuneralservice.com.